When updating my software I am getting a Reason = 9 File may be corrupt. What is causing this error? This error is caused by updates/patches that may have been damaged during the update process. This error can only be remedied by calling in to Drake Support at (828) 524-8020. After selecting to Install, an Update Error! Message produces, indicating Reason = 9: File may be corrupt, and will display which file may be causing the error. 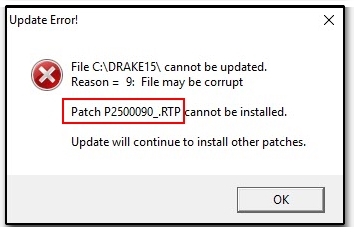 Retain the Patch number shown in the error to reference to Drake Support. If you experience this issue, please contact Drake Support at (828) 524-8020 for assistance in correcting the error.